Your vehicle is capable of towing trailers up to 2,000 lbs (907 kg) without added equipment or alterations to the standard equipment. Your vehicle may be factory equipped for safe towing of trailers weighing over 2,000 lbs (907 kg) with the optional Trailer Tow Prep Package. See your authorized dealer for package content. 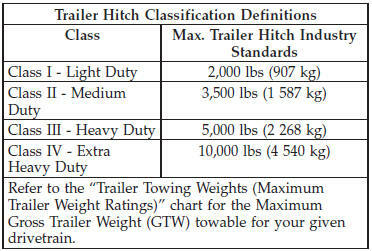 The following chart provides the industry standard for the maximum trailer weight a given trailer hitch class can tow. This should be used to assist you in selecting the correct trailer hitch for your intended towing condition. Refer to the “Trailer Towing Weights (Maximum Trailer Weight Ratings)” chart for the Max. GTW towable for your given drivetrain. All trailer hitches should be professionally installed on your vehicle.